Have you ever wished that you could pull aside the people running a company and explain to them the seriousness of the threat of class actions? My former colleague and current Greenberg Traurig partner Rob Herrington has done just that in his new book, Verdict for the Defense: Fighting Jackpot Justice with Firewall Defense Strategies. Although Rob's book has lots of good ideas that we as lawyers can benefit from, it is a candid and easily readable primer for business leaders on the scope of the risk posed by class actions and the simple steps such leaders can take to make it less likely that a class will be certified against their companies. I asked Rob a few questions about Verdict for the Defense, which is available from Amazon or directly from the website link above. His responses follow. 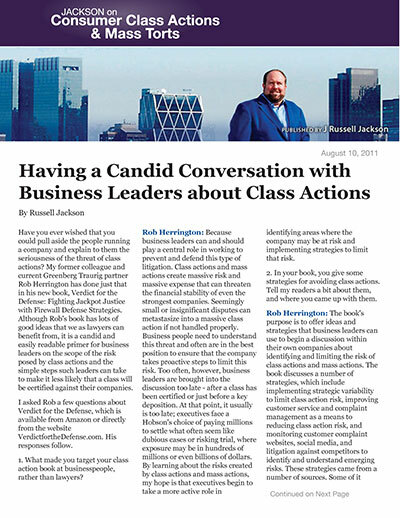 What made you target your class action book at businesspeople, rather than lawyers? Because business leaders can and should play a central role in working to prevent and defend this type of litigation. Class actions and mass actions create massive risk and massive expense that can threaten the financial stability of even the strongest companies. Seemingly small or insignificant disputes can metastasize into a massive class action if not handled properly. Business people need to understand this threat and often are in the best position to ensure that the company takes proactive steps to limit this risk. Too often, however, business leaders are brought into the discussion too late - after a class has been certified or just before a key deposition. At that point, it usually is too late; executives face a Hobson's choice of paying millions to settle what often seem like dubious cases or risking trial, where exposure may be in hundreds of millions or even billions of dollars. By learning about the risks created by class actions and mass actions, my hope is that executives begin to take a more active role in identifying areas where the company may be at risk and implementing strategies to limit that risk. In your book, you give some strategies for avoiding class actions. Tell my readers a bit about them, and where you came up with them. The book's purpose is to offer ideas and strategies that business leaders can use to begin a discussion within their own companies about identifying and limiting the risk of class actions and mass actions. The book discusses a number of strategies, which include implementing strategic variability to limit class action risk, improving customer service and complaint management as a means to reducing class action risk, and monitoring customer complaint websites, social media, and litigation against competitors to identify and understand emerging risks. These strategies came from a number of sources. Some of it comes from personal experience, but most came from interviews and research. In writing the book, I interviewed several plaintiffs' class action specialists and grilled them on what they look for in identifying and filing new class action and mass action cases. Those interviews led to a number of strategies for reducing class actions. During the research phase, I also studied all of the major class action decisions during the past decade, trying to identify trends and factors that led to a successful outcome (i.e., prevailing on a motion to dismiss or defeating class certification). The book tries to meld this research with risk management principles to give business executives an overall framework and process for identifying these risks and working to limit them. A lot of people predicted that consumer class actions would be dead after the Supremes' recent decision upholding arbitration clauses and class action waivers in consumer contracts. I was skeptical of that viewpoint. What's your view on the subject? Consumer class actions are alive and well and present just as great a risk as ever. Having spent more than a decade litigating these types of cases, I am constantly amazed by the ingenuity and tenacity of the plaintiffs' class action bar. They will continue to present challenges to arbitration clauses and class action waivers in consumer agreements on any number of grounds. Public Justice, for example, has published an article offering 12 arguments plaintiffs' lawyers can use to challenge these provisions. It also will be interesting to watch whether plaintiffs' class action lawyers start trying to use collateral estoppel principles to expand the impact of individual arbitration awards, if successful. Now is not the time for companies to let down their guard. These recent Supreme Court decisions have created an opportunity for companies to take a hard look at their business processes and start to implement methods to reduce the risk of these cases being filed. What is the single legal reform that would have the most positive impact on the defense of class actions going forward? Not fair limiting it to just one. Let me offer a few ideas. First, impose a discovery stay and a heightened pleading standard for putative class actions, similar to the reforms instituted through the Private Securities Litigation Reform Act (PSLRA). In too many cases, plaintiffs' lawyers use discovery, particularly the enormous costs of e-discovery, to put pressure on defendants to settle. There is no reason to permit plaintiffs to wield that type of weapon until the court is satisfied that the complaint states a cause of action based on facts, rather than speculation and innuendo. Second, permit an immediate appeal of orders granting class certification (rather than just those denying) and permit more robust review by appellate courts. An order certifying a class action is a game changer, creating massive exposure and massive risk for any company. It is too important to leave to the discretion of a single judge. Finally, implement a system that requires plaintiffs to pay for discovery costs up and until the point where they can establish, through evidence, a prima facie case of liability. Discovery costs in class actions and mass action are asymmetrical, with a far greater portion of the costs falling on defendants because the defendant typically has far more information and documents. Plaintiffs' lawyers sometimes use that asymmetry to increase the costs of litigation exponentially in the hope of creating settlement pressure - pressure that has nothing to do with the merits of the case. Removing that tactic would make the process more fair, straightforward and efficient. What's the one thing that companies faced with class action lawsuits most often fail to do that would improve their chance of prevailing if they would do it? That's hard because there is no magic bullet to defeating these cases. The "trick," if there is one, is understanding the risks these cases present, including how and why they are filed, and then establishing defensive measures designed to reduce risk and maximize effective defense arguments. But if you're looking for just one simple strategy, consider this: when a consumer class action is filed, one of the first things the company will be asked to provide is the advertising/disclosures/packaging/contracts/webpages that the named plaintiff viewed. Many times these materials are subject to judicial notice in connection with a motion to dismiss and can provide the basis for a solid Rule 12(b)(6) challenge, which could end the case before it gets started. The next thing the company will be asked for are all versions of the various advertising/disclosures/packaging/contracts/webpages for the product or service that is at issue in the case. The hope is that there are a number of different versions with (hopefully) material differences that can be used to defeat class certification. I am consistently surprised how often companies are unable to provide this information, often because of lax or nonexistent record-keeping practices. When that happens, the company can lose one of the most effective weapons in defeating class actions, leaving it to proceed with expensive discovery and increasing the chances of a certified class. If a company wants to improve its ability to defend consumer class actions, it should take a hard look at its record keeping and ensure that it can readily provide the documents and information needed to effectively defend these cases.